Expect a Miracle: Time for an update and BIG news!!!! Time for an update and BIG news!!!! 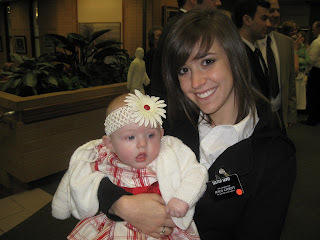 We took my sister-in-law to the MTC yesterday! What a wonderful experience. I'm sure going to miss Kristi... I mean Sister Hurd, but I know she is going to be an incredible missionary! The people in Houston, TX are going to be blessed to know her! Finally, our most exciting update!!!! We have completed all of our paperwork, and had our last home visit, and we are set to finalize Ellie's adoption on April 13th! And more importantly, Ellie will be sealed to us on April 18th in the Salt Lake Temple!! I can't believe it's already here, Ellie has been such a sweet miracle! She rolls all over the place now, and she is starting to give kisses! She grabs my face with her little hands and comes at me with an open mouth! Ohhhh, I looooove it! She is the sweetest baby. How blessed we are to have her! We had our last home visit last night and our case worker asked me how I was bonding with Ellie and to describe our relationship. As an adoptive mother it's hard to describe your feelings to people who haven't adopted. 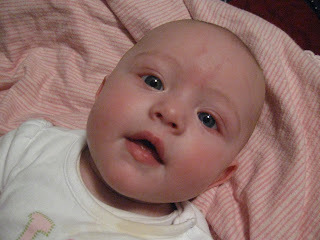 Before we had Ellie I wondered if I would love a baby that was not "biologically" ours as much as I would a baby that was born into our family. It's a very real concern for adoptive couples, but like I told our case worker, Ellie belongs to us, she was meant to be in our family. I don't question that she is my daughter and I know that she is loved every bit as much as any child that may or may not come to us "biologically." She is such a lucky girl to have not only our family that love her, but a whole birth family that love her also! She is definitely a loved little girl! That's great news Jenny! What a wonderful experience it will be to have Ellie sealed to you and Jeremy! Congratulations. Yay! I am so excited for you!! She's adorable. Hooray! I can't believe how the time has flown. Only a few weeks left. I will be in SLC for the Wicked matinee that day. It's funny, now that i've adopted i wonder if i would love a bio child as much! haha! not really, but ya know what i mean, right? i remember Marie Osmond was once asked which ones of her kids were the adopted ones? she responded by saying she was not sure, she did not remember, they all felt like hers and there was no difference. i imagine that's just how it would be. :) congrats on your upcoming finalization and sealing. it will truly be the MOST amazing day!!! Wait!...She's not your biological child? You sure had me fooled! ;) I have loved watching you as a Mommy. This little girls is so lucky to have you and Jeremy, but (and I say this in the MOST humble way) she is more lucky to have an Auntie Jena that loves her very much! Can't wait to come out and see you all be sealed together! You are right, Ellie fits perfect into your family! Love you guys tons!!!! Congratulations on all the fun updates! Especially about Ellie--that is the most exciting news!! Families really are forever! 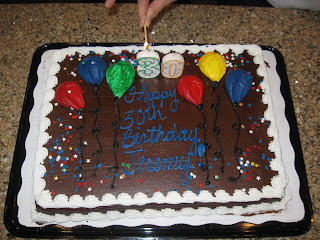 Happy 30th Jeremy. 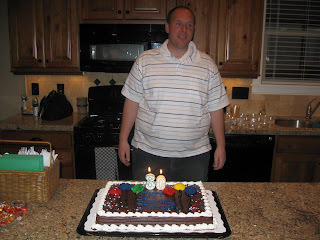 Greg turns 30 next month!! Ellie is so cute and getting so big. Congrats on getting everything finalized. It will be so special to finally have her sealed to you!! LUCKY DAY!!! Yay! I'm sure it feels good to be able to get all your visits and stuff done. I'm excited for you to be sealed. What a happy day! Congrats! Jenny that is so exciting, I love to read about your little miracle. She is so beautiful and I'm sure you are a wonderful mother. That will be such a blessing to have her sealed to you and know that she is yours forever. We'll keep an eye out for Sister Hurd! How exciting! I often help serve at the zone conference luncheons and get to see lots of missionaries there. Also, we are always running into misisonaries at the temple and at Nauvoo Books where Caitlin works. Congratulations on Ellie! She is so blessed to have you two for eternal parents!